Rev. 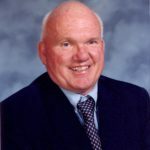 Patrick J. Hayes, CSV, died Wednesday, October 20, 2004, at Holy Family Nursing and Rehab Center, 2380 E. Dempster Street, Des Plaines, Illinois. Fr. Hayes was 88. He was born in Edmen, Illinois on March 12, 1916 and was the son of the late Patrick L. and Catherine (Ryan) Hayes. Fr. Hayes was preceded in death by his parents and one brother, Leo Hayes. He is survived by two brothers, John T. Hayes of Emden, Illinois and Gerald Hayes of Delavan, Illinois, and his two sisters, Mary (Joseph) Allman of Monticello, Illinois and Margaret Hayes of Denver, Colorado, and many nieces and nephews. Fr. Hayes professed First Vows as a Viatorian September 8, 1936 in Lemont, Illinois and Final Vows November 20, 1941 in Bourbonnais, Illinois. He was ordained to the priesthood in Springfield, Illinois by Bishop Griffin on August 29, 1943. He graduated from San Jose Community High School in San Jose, Illinois (1930-34) and St. Viator College in Bourbonnais, Illinois (1934-1938). He attended St. Ambrose College in Davenport, Iowa (1938-1939), where he received an A.B. degree in English. He continued with graduate studies at the University of Illinois, (1939-1942) where he received an A.M. degree in English. He attended Kenrick Seminary, St. Louis, Missouri (1940-1943), and Loyola University, Chicago, Illinois (1952-53). His first assignment was Working Boys’ Home, Chicago, Illinois (1937-38) as prefect. He was assigned as an English teacher to Sacred Heart Seminary, Melrose Park, Illinois (1939-1940), as grade school teacher at St. Joseph School for the Deaf, New York, New York (1943-46), as instructor of English, Poetry and Composition at DePaul University, Chicago, Illinois (1946-49), and again as an English teacher at Archbishop Stepinac High School, White Plaines, New York (1949-50), and Spalding Institute, Peoria, Illinois (1950-52). He was Assistant Pastor of Holy Trinity Church, Indianapolis, Indiana (March 1952-July 1953), St. Viator Church, Chicago, Illinois (1956-1963), and St. Viator Church and Guardian Angel Shrine, Las Vegas, Nevada (1963-68). 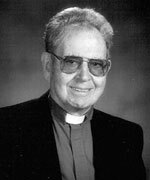 He served as Chaplain at St. Joseph Hospital, Mitchell, South Dakota (1953-54), St. Luke’s Hospital, Aberdeen, South Dakota, (1954-56) and Shapiro Development Center, Kankakee, Illinois (1968-1981). In 1981, Fr. Hayes retired to a Viatorian residence in Las Vegas, Nevada, where he was Local Director. In August of 1998, he moved to the Province Center residence in Arlington Heights, Illinois where he lived for four years before moving to Hopedale Commons Nursing Home, Hopedale, Illinois. Fr. Hayes recently moved to Holy Family Nursing and Rehab Center in Des Plaines, Illinois, where he resided until his death. Please remember our brother Pat and his family in your Masses and prayers.